AcousticPods.co.uk were asked to help with noise problems at a new clients building. Located in Exeter in the architect informed refurbishment of Wat Tyler House, Exeter CVS is working with local organisations and individuals to build a thriving wellbeing community. 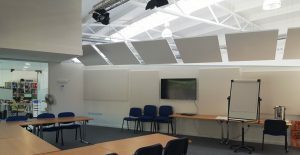 The Conference Room certainly had its challenges for the team at AcousticPods since the interior ‘village street’ type setting with open roofs to very high sloping canopy ceilings restricted the elements that we could introduce. The client was keen to avoid detracting from the unique design of the building and required solutions that blended in to the existing fabric. The S4 Acoustic Wall Panel System and S4 Raft System were recommended and our calculations demonstrated that the deployment of an appropriate surface area of these products across the space would provide a drop in reverberation times to a much better level. This would improve the sound issues dramatically. The products were manufactured within 2 weeks and installed to meet a deadline that allowed a launch event to take place. “We were very pleased with the help and assistance from AcousticPods and their experience in the area of sound control was invaluable. We were able to look at theoretical data to ascertain that the products would improve our environment and were given informed guidance about the range of suitable options. The acoustician driven bespoke information from AcousticPods was really great. After the installation the feedback from the users of the space has been very positive. A big positive step forward. We would highly recommend the services of AcousticPods.co.uk”.